Boris Johnson has been told to quit public life by Ken Bigley's brother Paul during a visit to Liverpool. Mr Johnson is in the city to apologise for a magazine article which described the city as wallowing in victim status after the murder of hostage Mr Bigley. The victim's brother tackled the Tory culture spokesman and Spectator editor during a BBC radio phone-in. 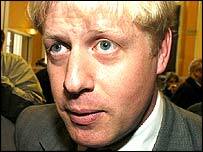 Paul Bigley described Mr Johnson as a "self-centred pompous twit" who should "get out of public life". He added: "You made a terrible, terrible mistake saying what you did and you have apologised for that. "I think the power of your comments are such that I don't think anybody in the public eye wants to see you again. "My personal feeling towards you are you are a self-centred pompous twit - get out of public life, go and do something in the private sector." Mr Johnson, who says the article presented an "outdated stereotype", said sorry for inaccurate claims that drunken Liverpool fans contributed to the Hillsborough disaster. But he said he could not retract "the broad thrust of the article" about sentimentality and acceptance of risk in modern Britain. During the BBC Radio Merseyside phone-in he said his party leader, Michael Howard, had been "completely wrong" to describe the editorial as nonsense from beginning to end. The Conservative leader demanded the Liverpool visit as a penance for Mr Johnson's comments. Tory officials sought to keep details of Mr Johnson's visit secret but he travelled to the city on Tuesday and spent the night in a local hotel. Mr Bigley's nephew, Ken Jones, criticised the visit. "Mr Howard should not send him here, he should send him packing." The Spectator editorial criticised the way Liverpudlians reacted to the killing in Iraq of Mr Bigley and accused them of "mawkish sentimentality". It also blamed drunken Liverpool fans for contributing to the Hillsborough disaster in 1989. Later, in a letter to the Liverpool Daily Post, Henley MP Mr Johnson said: "I am sorry, too, for the hurt and dismay we have so evidently caused in our description of Liverpool. "There may well be Liverpudlians who still answer to the characteristics in question, just as there are all over the country. We should not have generalised. "I repeat that the leader [Spectator leading article] made a serious point about risk and sentimentality, and the culture of blame, and I stick by it. "In so far as it imposed an outdated stereotype on the whole of Liverpool, and thereby caused offence, I sincerely apologise." Mike Storey, Liberal Democrat leader of Liverpool City Council, accused Mr Johnson of snubbing attempts to arrange a meeting with the bishops of Liverpool and representatives from the Hillsborough Support Group. "We wanted to give him an opportunity to hear the city's views and opinions and to make a sincere and genuine apology but he has chosen not to take up that opportunity," said Mr Storey. "It now appears to be the Boris Johnson show, it is just a massive PR stunt. My advice is for everyone to quietly ignore him." A Tory spokeswoman denied the snub claim, saying the city council was the first body approached by Mr Johnson. "However, they said that they would only meet on an exclusive basis and on the condition that he would not meet anyone else in Liverpool," she said. Councillor Joe Anderson, the leader of Liverpool's Labour group, said the visit was "nothing more than a gimmick". "Boris Johnson is not welcome here after the publication of the article re-hashing all the old prejudiced and stereotypical views of Liverpool's citizens. "It would be better for him to keep away at this time."